Our gray block retail furniture help store owners create contemporary merchandising environments. The furnishings feature a simple, clean design that feels fresh and puts emphasis on the merchandise. This gray block retail furniture showcases clothing, shoes, and fashion accessories with high visibility to make them stand out to customers. 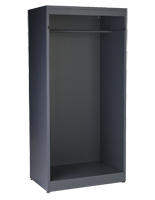 The modern store fixtures are available in a number of styles to accommodate your merchandise and space requirements. 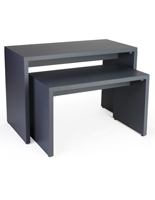 Gray block retail furniture from Displays2go comes with quick shipping and wholesale pricing for added convenience. What minimalist-style store fixtures do we sell? Our gray block retail furniture includes garment racks that display clothing on a hang rail. Each fixture has a simple, open design that perfectly frames hanging shirts, dresses, and jackets. These racks make garments pop, whether they're placed in a trendy boutique or a second-hand shop. 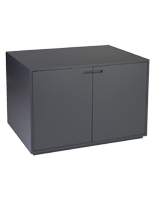 Minimalist-style storage cabinets have a large internal area for keeping supplies. They also feature a wide countertop for displaying merchandise on top. These multi-use fixtures make it easy to store valuable inventory both in and out of sight. The block retail furniture has two swing-open doors and no shelf, providing easy access to ample storage. 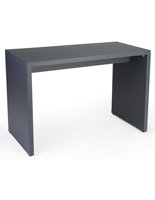 Gray block nesting tables are another excellent solution for featuring merchandise. Our stylish countertops feature a sharp design that makes wares shine. These fixtures let retailers create interesting product showcases using multi-table displays. 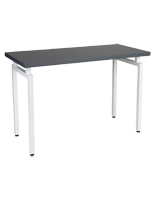 Choose from models with a full MDF construction and units with white steel legs that contrast the gray countertop. 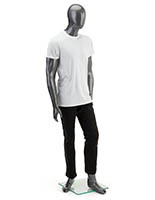 Our gray line of retail furniture also includes mannequins with a modern metallic finish. The display forms have an abstract construction with a featureless face and no hair, putting all the attention on the garments. 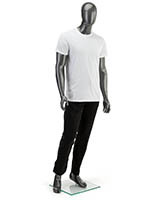 Contemporary mannequins are excellent additions to shops that need chic clothing display solutions. 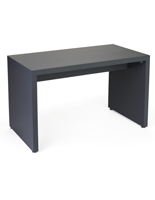 Why should you choose minimalist-style retail furniture for your store? These contemporary furnishings tell customers that you and your inventory are up to date and worth their attention. Imagine browsing a shop with faded merchandisers from the 1970's — it would look like the owners don't care about their presentation. Our stylist furnishings create an inviting and functional environment with contemporary designs. In addition, this furniture also has a neutral design that matches the color of most walls and existing fixtures. Our nesting tables, garment racks, storage cabinets, and metallic mannequins will fit in any location!